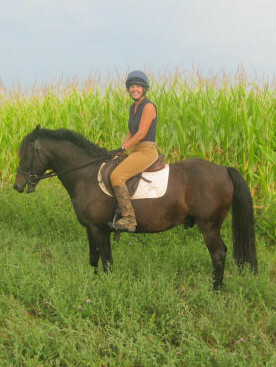 Happy Endings do happen ☺…Remember the two ponies Julie and I rescued from the kill pen at the Camelot Auction last July ? Well, I’m Happy to report that Pez has turned out to be the PERFECT pony for my best buddy Julie’s little girl Elisa and Skipper has found his calling as a hunt pony. 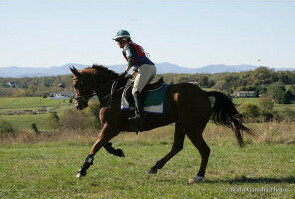 He is currently trail riding and walking hounds with the Warrenton Hunt. Anyone interested in helping horses in need, please feel free to contact me and I will be happy to assist you in any way I can. 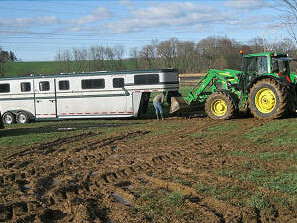 There are ALWAYS horses in unfortunate circumstances waiting for someone to help them. 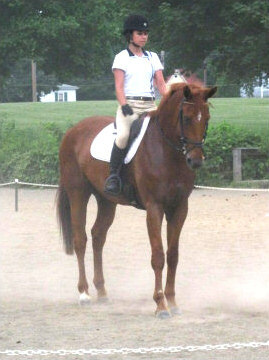 Please consider helping a horse in need. Another great weekend for the baby horses at Bidawee farm. Natalie and Buie were once again Stars in their big move up to Beg, novice bringing home a 6th place ribbon ( they would have won their division if Buie hadn’t had a silly “wb ” moment “in show jumping. 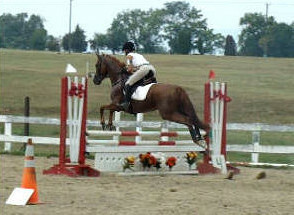 Ethan was very brave for his move up to novice with a double clear SJ round to bring home a 3rd place ribbon. 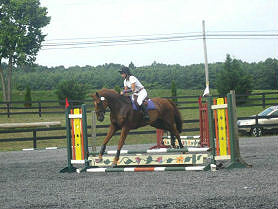 Thank you to Colleen Muldoone for allowing me to show her fabulous young horse, Jessie. Jessie was a super star for her debut horse show putting a lovely dressage test with a score of 24.5 and was very brave for the challenging show jump round. With the exception of one baby moment at the 1st fence ( a scary red gate) Jessie jumped around beautifully to bring home a 4th place ribbon. Ethan also was a good boy, but a little tense in the warm up, which of course reflected in his dressage test, but he pulled it together and put in a lovely Show jump round both at Beg novice and Novice .. Everybody keep your fingers crossed for me I really like this horse and have high hopes for his future. 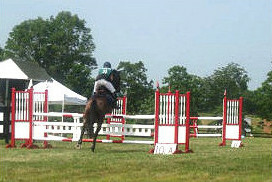 Congratulations to Natalie Forbes for an outstanding ride at the Sandstone CT July 23rd. 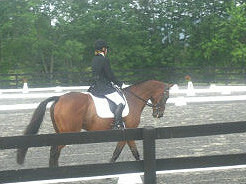 Natalie and Buie put in a beautiful dressage test to score a 25.0 and finished 2nd the Baby novice division. 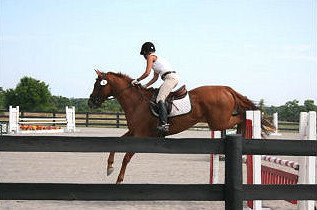 They also made their debut in the jumping phase in Beg Novice putting in another clear round .. Way to go Natalie !! Ethan also put in a great day’s effort on his first outing ever finishing on a dressage score of 32.4 bring home a 2nd place ribbon in the Beg Novice division. 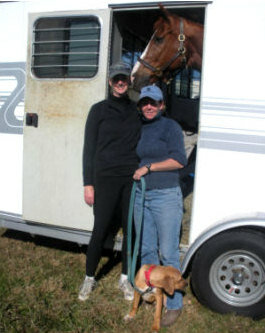 Read about the Camelot Rescue Trip – Julie and Sharon rescue a couple of ponies from the kill pen in NJ at the Camelot Auction. 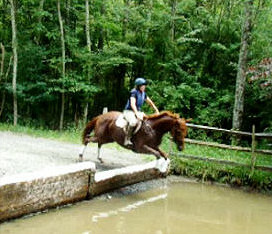 Rubicon HT was held June 11th in Lucketts, Virginia. 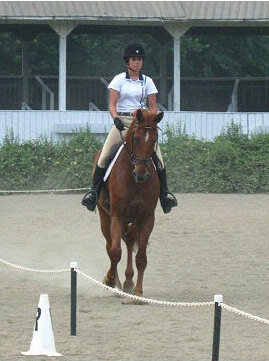 Mickey and Sharon were in the Preliminary Rider division. 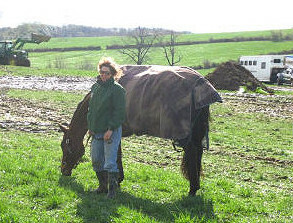 Fortunately, Sharon was lucky enough to receive grooming help from Natalie Forbes. With temperatures in the low 90’s, by the time we packed up for home, it was a warm day and the grooming help was very much appreciated, thank you Natalie!! 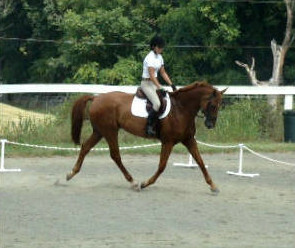 Mickey warmed up nicely for Dressage, despite the climbing temperatures, and scored a 37.5 putting them in 4th place. Lynn Symansky took the time to warm them up for the SJ phase and Mickey put in a super effort before having to head out on XC!!! Again on XC Mickey galloped well and answered some very difficult questions leaving Sharon feeling confident as they head toward the CIC* at Stuart. Mickey and Sharon finished nicely in 6th place!! What a team !!!! 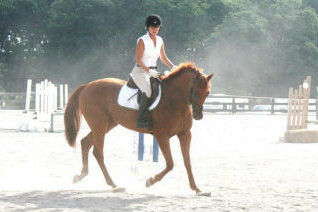 Natalie and Buie where fantastic competitors at the Warrenton Dressage Show under the lights. The judges scores of a 26.4 on USEA BN test A and 27.6 on BN test B reflected all the hard work the two of them have put in over the last several weeks WAY TO GO Natalie!! 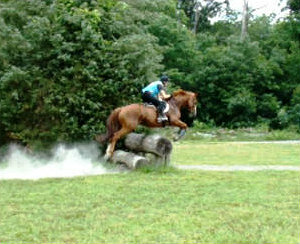 Bidawee farm takes the baby horses on a XC schooling day at Frying Pan Park. 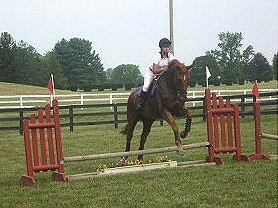 Watch for these fabulous horse and rider combinations in competition in the near future. Follow along as Sharon and Mickey make their final bid for the CIC* at the Cosequine Stuart Horse Trials July 13-18, in beautiful Victory, NY. Already fully qualified, we are looking forward to a couple more runs at the Preliminary level starting the weekend of June 11th at Rubicon HT in Leesburg, VA. This horse trial is always run beautifully, and everyone involved is wonderful, making Rubicon, a horse trials, one that no one wants to miss. 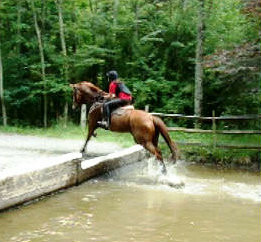 Seneca ValleyHT will be next up for Mickey, on June 18th in Poolsville, MD, another fabulous venue, hosting wonderfully constructed X-C jumps to gallop. 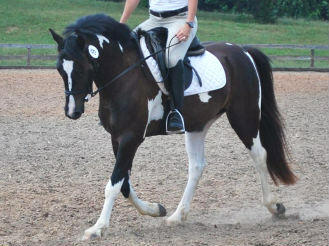 The final outing, before heading to Stuart, will be the Compass Rose Dressage show, giving this dynamic duo the prefect opportunity to practice the FEI* star dressage test. Stay tuned for the ups and downs that are sure to pave the path on our way to Stuart! Despite awful weather conditions Mickey was a star at Plantation horse trails putting in his best dressage test to date and a good effort, in less than ideal show jumping conditions. We considered ourselves lucky to be able to complete 2 out of the 3 phases. 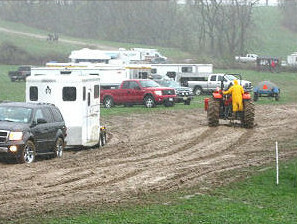 XC was canceled on Sunday due to severe damage to the show grounds. 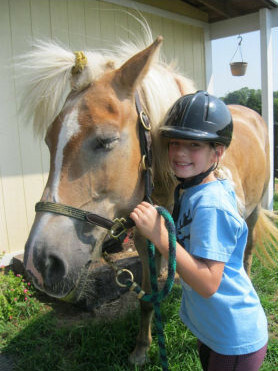 Spring is here and there are lots of wonderful things happening at Bidawee farm !! 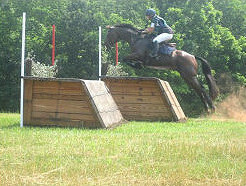 Next Mickey went to the horse show grounds at Loch Moy for another CT at the prelim level finishing 3rd and Al continued his success at Kelly’s Ford CTfinishing 2nd on his dressage score in the BN division. 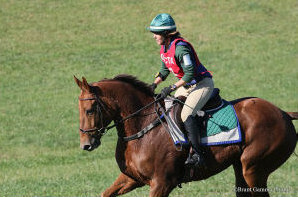 Next was the first upper level event of the season for Mickey and Sharon at the Movran spring HTand MICKEY ROCKED IT with a clean XC finishing 11th in the OP division. I’m so proud of him !! 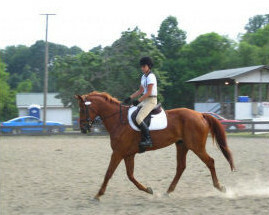 He’s starting to become a REAL Prelim horse!! 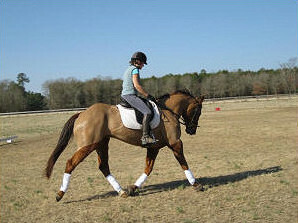 Well this year I was lucky enough to start the competition season in Aiken SC with 12 days of wonderful weather for horsing around in and although the drive is long (9 hours ) it is well worth it for the fabulous sunshine and footing. 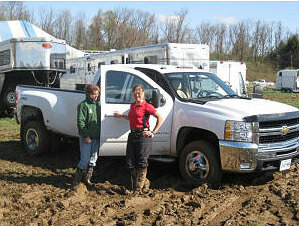 Day 1 was a hack day just to loosing them up from the haul but day 2 we went right to work flat lessons form Lynn. It was very informative and I took away a lot of information from it though Al really showed his greenness in the steering department. Congratulations, to my very good friend Julie Hansen and her horse Irish Blessing for their 1st place WIN, finishing on their dressage score of 27.5, in the OBN division at Kellys Ford, in Remington, VA. What a great way to end the season!!! WAY TO GO JULIE!!! 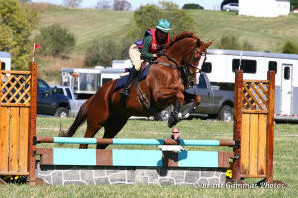 Sharon and Micky put in another impressive run at the Preliminary level this weekend, at the Virginia Fall Horse Trials, in Lexington, Virginia. 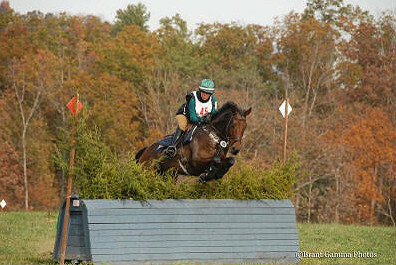 It was everything one would expect in a challenging Area II Fall Preliminary cross country course and more!! Way to go Micky, what a superstar! 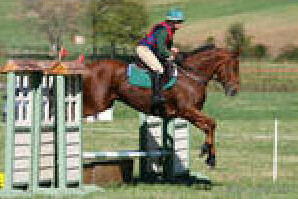 Congratulations to Sharon and Al on an impressive 2nd place finish in the Baby Beginner Novice division of the CDCTA horse trials. 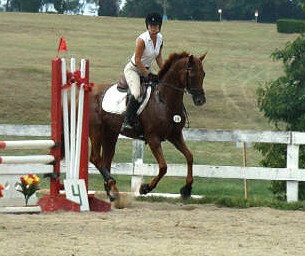 Sharon and Irish Blessing, owned by Julie Hanson, also placed 6th in the Open Beginner Novice division. Great job! The list of successful Preliminary runs for Sharon and Micky is piling up, this fantastic pair is now qualified for a CIC*. 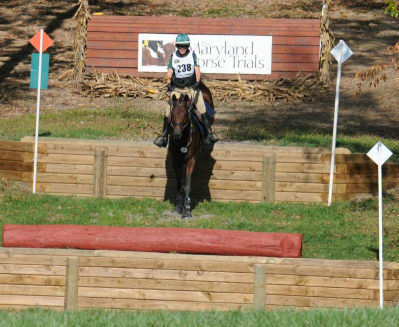 Lets have a nice round of applause for Sharon and Micky for another super showing at the Maryland horse trials this past weekend! 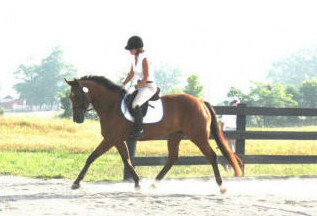 Al had a wonderful first outing at the Warrenton dressage show this past weekend. He is turning into quite a wonderful mount. 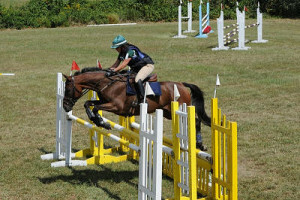 Micky and Sharon are racking up the list of successful Preliminary horse trials, with another clean x-c round at the Fall Seneca Valley Horse Trials. 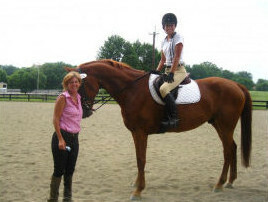 It’s looking like a very exciting fall event season for this dynamic duo, go Sharon and Micky!! 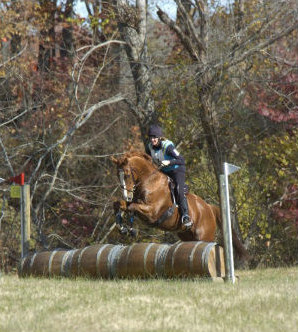 Micky was a rock star, as he cruised around a really big and challenging Preliminary x-c course at the Loudoun Hunt horse trials at Oatlands, this weekend, landing in 6th place. Congratulations Sharon and Micky!!! 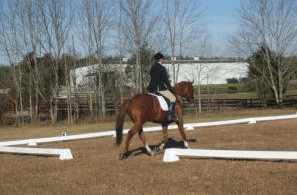 Al was wonderful at his 1st CT at Glenwood park in Middleburg, VA. Al finished 2nd on his dressage score of 38.5 in the Baby Novice division !!! What a good boy for his first outing. 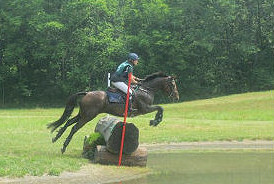 Sharon and Micky successfully completed their first Preliminary horse trials at the Highlands at Loch Moy, aka the Maryland horse trials. 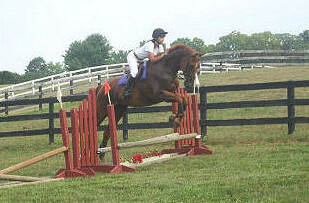 Micky was a star and jumped around the cross country course without batting an eye. Congratulations to Sharon and Micky for a successful move up to Preliminary!! 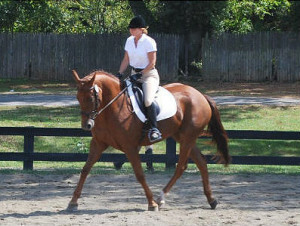 Gunnar just completed 6 weeks of training at Bid-a-wee farm and Carla and I decided to show him off at Cedar Run’s Dressage show this past weekend! It’s a wonderful place to introduce the babies to an indoor. 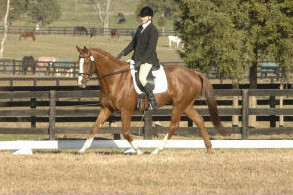 Gunnarwas a star of course and stole the show, wtih hisfabulous attitude and great movement (Art deco is his Grand dad ). It’s hard to believe he’s just a baby with the great mind this guy has. 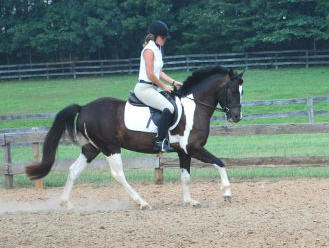 His future holds endless possibilities for this fabulous boy! 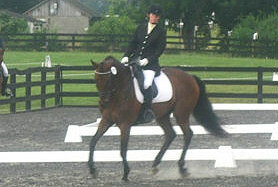 Al also completed his 1st show debut successfully, with a soaring 65.5% in beginner novice test A. He received 8’s on several of his movements. Mickey was a star at senaca, finishing 6th in the OT division and also took home 4th at the Compass Rose combined test, in the OP division, way to go Micky! 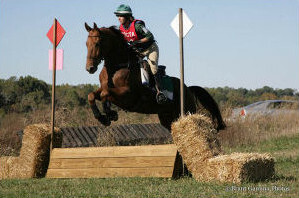 Micky was a star at his first USEA Prelim/Training event, bringing home 8th place. 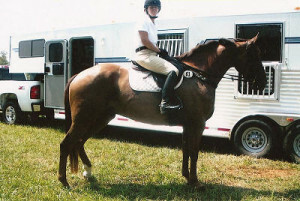 Sharon and Micky will be competing at the Senaca Valley horse trials on June 12th in Poolesville, MD, in the training division, then going onto the Preliminary combined test the following weekend at Compass Rose. Micky brings home an impressive 3rd place finish at the Preliminary MOC combined test this past weekend at Glenwood Park, no rails, go Micky!!!! Micky brings home a blue ribbons from the CDCTA young Rides benefit Combined Test on April 10th in the Training division. What a good boy! 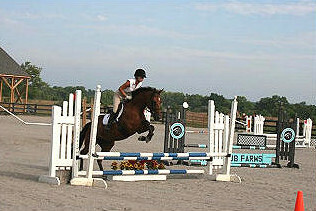 Congratulations to Skyler Icke and Alabee on winning their first combined test event at Paradise farm! 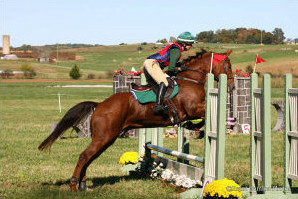 The spring season has started and Sammy was a star at The CDCTA horse trials in Culpepper. 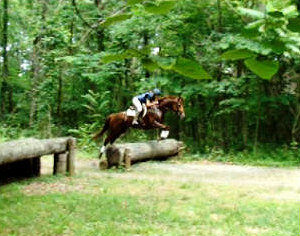 This was Sammy’s1st horse trial and he was a superstar, what a GOOD boy! Sammy completed all 3 phases with a super positive attitude and finished on his dressage score of 36 to bring home a 3rd place ribbon! Well, the weather has finally given in to spring. Time to put the inside projects away and try to catch up a little from the very long winter. 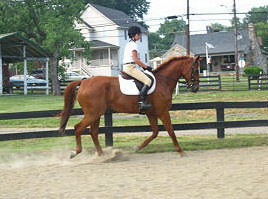 Mickey will be going to Lexington VA at the end of the month for “spring fest ” a warm up X_C school and CT test and Sammy will be joining him … of course just doing the baby stuff .. next will be Sammy’s turn at CDCTA in Culpepper the weekend of April 4th and then Mickey will do his 1st recognized event of the season at Loudoun April 23th and 24th …Hope to see everybody there !! Teddy is back in training and didn’t miss a beat ……And Conner has just started his training program … So far looks like he’s going to be Debbie’s next super star … this horse is so smart!! 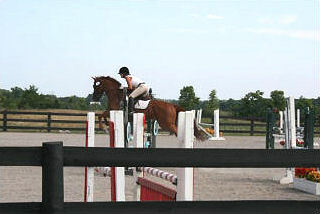 Well, off to a jumping lesson today and then Dressage at Lauren’s tomorrow! 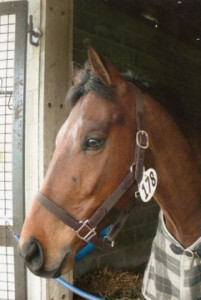 Read Troy’s Story – Meet Troy, a 12 year old paint that was rescued in September of 2009 by Bridlespur farm.